Just wanted to share what I thought was a reasonably valuable tidbit today. It’s about organizing client data. I’ve done this long enough now to know there has to be some sort of logic as to where you save something or what you name it. I’ve never really found anyone else talking about this so I thought I’d throw this out there. I keep all my client data under a “Client Works” folder, with each client having their own sub-folder therein, with their name on it. 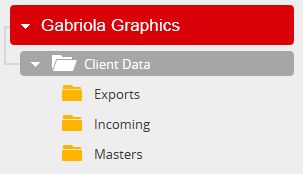 Inside a client folder is always the same 3 folders: Masters, Incoming, and Exports. The “Masters” folder keeps all the layered, original or native files. If I ever have to edit a project this is where the file will reside. The “Incoming” folder is for all the files I use to complete the project. This includes stock photos, images, collected or sent source files, etc. Anything coming “in” to work with on the project. And lastly, the “Exports” folder is where all the “exported from native applications” files end up. These are often the files that end up online or send to print publishers. Anything leaving my computer for another destination would be found inside the Exports folder. Flattened graphics files, fonts converted to outlines, transparencies for specific file types, color separations, etc. As for file naming conventions you can use whatever you wish and however you like. For me, I like to save multiple versions throughout working on a project so that if I ever wish to step back a few iterations (if I’ve outright botched something, or am taking off on a design tangent I’m not loving). For this reason when I reach what I feel is a good point I’ll save my work with the client name or initials, type of project, and a version “appendage” such as -v1, -v2, v3, etc. Nothing really amazing here. I’d like to think anyone working with or just using computers will all ready have their own structure or naming conventions. Just wanted to take a minute and share mine. Locate32 finds files and directories based on file and folder names stored in a database. Locate32 saves to a database the names of all files on your hard drives. Once the file indexing has occurred, you can locate files quickly by using the application’s search form. It works like “updatedb” and “locate” commands in Unix. In other words, it uses databases to store information about directory structures and uses these databases in searches. The use of these databases provides very fast searching speed. The software includes a dialog-based application as well as console programs that can be used to update and access the databases. Locate32 is not primarily meant to find text or data within files, but it has a primitive feature to do this.